I was crushed when I was told, in 3rd grade, that Santa Claus was not real. I wasn’t ready for that information. Some older boys down the street from me cruelly planted the idea in my head on a walk home from school. “Do you believe in the Tooth Fairy?” they demanded amidst knowing, malicious snickers. I shook my head confidently after each question. I was no fool. “It’s your mom!” the boys exclaimed after each question in a voice that mocked my confidence. Still, I refused to believe it. I’d thought I’d seen the light of Rudolph The Red-Nosed Reindeer’s nose in the night. I’d sworn I’d awoken to the bells of Santa’s sleigh in the dark of the early hours of Christmas morning. I used to panic on the way home from my Grandma H’s on Christmas Eve night, afraid that Santa would come to our house and, since we weren’t sleeping, would pass us by. I think my parents used to threaten us with that very scenario to get us to go to bed immediately when we got home. It worked. I would pull the covers over my head and make myself fall asleep no matter how excited I was. It never once occurred to me that Santa Claus–or any of the other magical entities of holidays and lost teeth–were not real. It seemed absurd that my mom and dad would fool us by telling us about Santa Claus, and then placing the gifts under the tree themselves posing as Santa. I had never even hypothesized such a scenario. Still, I asked my mom. And she told me the truth. All of it. I cried. Hard. The tears burned my face and my heart throbbed in utter disappointment. I did not want this knowledge. I was not ready for this knowledge. I liked to believe in magic. And now the magic was gone. I’m pretty sure that that’s about the time that my faith in all magic started to disintegrate… The downward spiral away from God, religion, an afterlife that permeated my adolescent and early adult years. It was a little death in my heart. My brother walked into the room after my mom regretfully told me the truth about Santa. She had told me that I had to keep pretending about Santa because my brother was still younger and believed. I didn’t want to ruin it for him too, now did I? She tried to put a positive spin on this “coming of age moment” by telling me that it was now my responsibility to help her keep up the fun for my brother until he was ready to learn the truth. My brother wondered why I was crying. I suddenly felt very sympathetic towards him–he still believed in the magic that I now knew was not real–and I wished I could be in his place. I put my arms around him, hugged him tight. My mom grimaced, afraid I might let out the secret like those idiot boys down the street had done. But no. I was not about to ruin anyone else’s fun. I hugged my brother right and asked him what he wanted Santa to bring him this year. Even though I think it was early spring at the time, not Christmas time at all. I wanted to believe the words myself. Maybe if I pretended, it could still be real. I don’t know when my brother learned the truth about Santa. But I kept up the spirit for years until “Santa Claus” stopped appearing in the From spot on the present tags. And when my brother stopped hurrying to bed on Christmas Eve night, I knew he knew. But we never discussed it. I’m pretty sure he probably took it better than I did. I’ve always been the one with the wild imagination, the one who liked to pretend, the one unable to accept reality even in the face of it. I was reminded of this story a few nights ago when I watched the movie The Polar Express for the first time. In the scene where the little boy finds the bell that falls from Santa’s sleigh, and he hears it ringing as he picks it up, I started crying. I was really surprised by my reaction. I’ve cried in movies before–most recently, during any movie involving the death of a character as my widow senses always tingle with all-too-real memory to augment any fiction–but never before have I cried the kind of tears that pushed themselves from my eyes when I watched that movie. I felt my heart swell with a sort of melancholic relief because the little boy in the movie finds proof that Santa is real. Because I want to believe that Santa is real. I could feel the words forming in my head even as the boy said them, “I believe! I believe in Santa Claus.” And at the same time, the adult me who knows that Santa isn’t real felt a sort of sympathy with the character, similar to the way I felt when I knew my brother still believed in Santa and I’d been told the truth. The tears just kept coming. My face was wet and I was embarrassed. I hurriedly tried to wipe them away before Crow could see them, but he caught them anyway. “It’s okay,” he said. But I still felt a little stupid. It’s a beautiful movie, really. We rewatched it again last night and the same thing happened. I just couldn’t control the tears. Some little girl inside me relates to this movie. She still wants to believe. She wants to completely accept the premise of the movie. She is found in the spirit of those characters. My eyes remained wet through the remaining scenes of the movie, as these incredibly cute and realistic-looking children emoted about their experiences, said their goodbyes, and returned to normal life after their visit to the North Pole. I felt sorry for the little boy’s parents on Christmas morning because they could not hear the bell and thought it was broken. I knew I was like the parents. But I wanted to be like the little boy and his sister who could hear the bell and knew it was not broken. In the end, the boy narrates that each of his friends stopped hearing the bell as they grew up… but that he always heard the bell for the rest of his life because of his experience at the North Pole. He never stopped believing. The tears flooded from my eyes again. I couldn’t stop them. I believe! I believe! a little voice in my head kept shouting. A little piece of my heart that was broken suddenly felt fixed. If you believe in anything enough, could it then come true? The following is Kristina Spaude’s “testimonial” from the service this morning (at the Unitarian Universalist Church of Kent). Her speech was so well-liked, we asked her to do it again at the second service (she was originally just scheduled for first). When I was first asked to participate in this service, I naturally said yes without thinking about it. When I got home later that day, I started to wonder, though, what I would say. So many people here have heard my story – and I know that there are more of you now who haven’t, but I thought, meh. So I returned to the sermon title, “Why This Church?,” and I knew that I would find something worth sharing. The first service I attended here was October 1, 2006. That day only one person talked with me, but I knew that this would be my home. Granted, I had been intentional about the first service I came to – a Yom Kippur service, which I knew that I would almost certainly enjoy. But it wasn’t just the sermon that I liked – it was everything about the service. And although only one person spoke with me that day, I was aware that this would be my home. I decided to make this my home. To testify to that is the fact that I almost never miss services. Apart from this last summer, when I was unable to attend for about 4 months due to my back problems, I have missed only 4 services. I don’t share this for any reason but to reiterate that this church, this congregation, this community is important to me. Church is not structured around my life; my life is structured around church. It’s about 4 years to the day now since I officially signed the book and became a member, but I had already been getting involved in different activities – primarily the Social Justice Committee and the Small Group Ministry program (now named Chalice Groups). Since then, I’ve been involved in… Well, so much that I can’t even remember it all off the top of my head. Currently I’m serving as a Worship Associate and as a Youth Group advisor. I also now have the privilege of having served as the Interim Office Administrator after Judy retired, which was also the time that Rev. Melissa was preparing for and going on leave, as Rev. Katie was coming on board as our consulting minister, as Pam stepped down as Sexton and Colleen agreed to serve as Interim Sexton, and as a permanent replacement was found for the office, who I also helped train. That was a position I loved – it was a gift to be able to do it, really like a dream come true, if but for a time. In considering the position permanently for myself, I had to make a decision – to serve the congregation in the office or to serve the congregation in the church. But it wasn’t really much of a decision for me – I chose to remain here with you. Why? The only way I can begin to explain why, what you mean to me, is to ask you to take a moment and look around this room and at the people in it. Not the people you know and you don’t know, not faces and names you recognize, but look at each other. Look into each others’ eyes. If you can’t see their hearts and souls, their divine spark, look again because you aren’t looking closely enough. Each of you made a choice to be here this morning, to be here together. To be here as your whole selves, because you know that you can be whole here – and you know that truthfully, we wouldn’t want you any other way. So, why? Why am I here, week after week, serving the congregation in most of the ways I’m asked to, to be here with you? Like you, I come here to be present and to be whole-ly present, to share this holy presence. I come here to be grounded, to be restored, to be renewed. I come here to share my journey with you, to receive what you offer me, to love you. I come when my heart is radiating with love and when I can’t help but cry, and you are here to celebrate and comfort me. I come because you help sustain me. You remind me of all that the world can be, that my hopes and your hopes, that my work and your work are for good cause and make a difference. You remind me of who I am, you teach me to grow more than I ever could have imagined, you ask me to share myself with you. I come to be, I hope, a reflection back to you what you are to me and so that perhaps my presence will serve as an expression of the gratitude I have for each of you and for this home we covenant to make here together. Today I co-lead a service at my church with two other people about the community of the church. For the sermon portion of the service, we asked a few members of our church to speak as to how their journey led them to this church and why they are members. The three of us who co-lead the service also gave our own “testimonials” that answered the same questions we asked of the other people we asked to speak. I wish I had a copy of each person’s speech–they were all so wonderful!–but I’ve included mine below. Enjoy! I always say that there are three things that saved my life after my husband died: U2 music, cycling, and this church. U2 music wove itself into the fabric of my soul, filling me with inspiration and hope when I had little of either. Cycling, by pushing me to my physical limits, helped me to learn the boundlessness of my strength. These were the two tools that carried me through my grief and the first six years without my husband Mike. But I yearned for something more. A spiritual connection. A faith I could truly believe in without having to fake it or lie to myself. Something I could accept wholeheartedly. I found that in this church. The first time I came to the Unitarian Universalist Church of Kent, I was frightened. I hadn’t voluntarily walked into a traditional church, other than for weddings and funerals, since I declared myself an atheist in sixth grade. I’d explored spirituality through a short stint with a group of pagans—who, incidentally, recommended Unitarian Universalism to me—but that was closest I got to participating in any sort of religious ritual. It was much easier for me to attend a pagan ritual, which was a completely foreign experience to me as an ex-Catholic, than it was for me to willingly walk through the doors of a church. It was a huge, scary step to come here. But I did. Because I was thirsty for community and spiritual enlightenment. I wanted a place that reflected my own values and would allow me to grow spirituality—whatever that meant to me at any given moment. And believe me, that changes from day to day. Hour to hour even. I noticed a kind of peace with my friends who had found a sanctuary in religion. I wanted to feel that too. And so I sought faith for comfort. I wanted to believe. I was drawn into this church the moment I entered. The sanctuary was small and familiar; familiar, even though it was completely opposite from the large, cold, and austere church I went to growing up. It lacked those familiar symbols of Christianity that always made me uneasy. I took a seat in the back—not too different than I do today—and I tried to remain inconspicuous and unseen. Which is extremely hard in this church where part of the welcoming ritual involves turning and greeting your neighbor. A lady sitting next to me introduced herself. She told me she attended this church sometimes, that she found the services comforting; she assured me that I would like it too. “It’s different,” she said. I was relieved because to me, different is almost always good. I want to say that there was an inspiring sermon that spoke to my personal values and satisfied some of my deeper spiritual quandaries. Sadly, I don’t remember what the sermon was about or who led it (it was lay-led). I experience life through music. In times of contentment or joy, music is the catapult that launches me into the atmosphere; when I hit rock bottom, music is the strong hand that pulls me back to the surface again. So it’s not very surprising at all that when Hal Walker opened the service with one of his beautiful, soul-searching songs, I was immediately moved. The music I found here in this church proselytized Unitarian Universalism to me. I signed up for the New UU class that day before I left and it changed my life. Through that class, I learned there was a faith that not only shared my common values but also allowed me to find my own truth and meaning in life. I was free to study whatever mysticism fascinated me—Buddhism, Islam, Judaism, Wiccan. Everything was fair game to ponder and consider. Even my own Star Wars inspired belief in a “life energy” like The Force. The Seven Principles were values I could get behind. The people here were welcoming and—most importantly—socially liberal. There was a general concern for social justice and being good stewards of the planet. I saw so many great values in this church, so much wonderful energy. I officially signed the membership book in November of 2007. Since then, I’ve made several friends through my involvement in chalice groups, a spare few committees, and serving as a greeter on Sunday mornings. Though my attendance at church is not as regular as I would like it, my heart is always here when my body is not. I’m proud to be a Unitarian Universalist—even though I always have to explain to people what that means—and I’m proud to be a member of this church. I’m in a much better place now emotionally than I was when I first came here. That’s because of all of you. You probably don’t even realize the little things you’ve done that have helped me reach this place, and that’s okay, because a community does without being asked. I’ve found great support here. I’ve found my spiritual home. It was exactly three years ago today that I stood before the congregation at the Unitarian Universalist Church of Kent and declared openly my willingness to become a member of the church and to accept the seven principles of the UU faith as my own. Today was our annual pre-Thanksgiving communion service–which is the same service at which I was welcomed into the UUC Kent community three years ago–and I had a bit of a spiritual experience. In the middle of one of the hymns early into the service, I realized I was actively singing while also swaying rhythmically to the melody. I didn’t care who heard my (really bad) voice; I felt comfortable expressing my enthusiasm for the song by moving with it. This is huge. Monumental, in fact, because it shows that I’ve lost some of my self-consciousness enough to really get into the moment of the service. I’m no longer worried that everyone is looking at me or passing judgment about my singing. Because I’ve let go of those little fearful voices in my head, I’m an open vessel to the community and the spirit. Or was my new freedom from self-consciousness caused by having delivered that same sermon I wrote before the entire congregation? Do I feel closer to everyone in the sharing of myself? From the many people who came to me after the service to share their own stories? Perhaps it was just the mere fact that I stood in front of the congregation and delivered a sermon at all–regardless of what I discussed–which has to be the scariest and bravest thing I’ve done in a long while. After that, my pew neighbors overhearing me sing (off-key) is nothing. I also wonder if because of the nature of what was shared in the sermon, I’ve completed some sort of vital exchange between my fellow congregants that is required to build a relationship. Many of them have also led services in which they shared their own very personal stories. For me, this sharing was always one-sided because I didn’t openly contribute. Now that I’ve delivered my own sermon, the circle is complete. Do we, in return, feel a little mutually closer to each other? Is this the “right relationship” my church speaks of in their covenant? It’s kind of validating to know I won’t be confused with someone else anymore. I admit that. I really wasn’t annoyed that I was mistaken for someone else. It just doesn’t really happen all that often to you when you’re named Heidi (it’s never been a hugely popular name). So I just wasn’t used to it. But it’s nice to know that now, for some people in the church, I’m not just that faceless person in the middle rows (I always strive to blend in by sitting in the middle). There’s acceptance within the community when people actually put your name to the face. I’m getting to know more people in the church too. I’m feeling more and more comfortable. Leading the service certainly helped me feel more comfortable as well as introduce me to people I only knew in passing. I’m starting to know some of the hymns and can sing them without the hymnal. Because I’m spending less time focusing on my fears, I’m allowing the spirit of the service to fill me up. I love when I get into the moment and live it. When goosebumps rise on my flesh in agreement to the wonderful words being shared. When I totally and completely let go of the thoughts that hinder my mind–the chores I need to attend to after church, the bike ride I want to go on, the argument I may have had with someone recently–so that I can listen to these words. Today was one of those services where I found myself really getting into the moment. Communion–a rare UU pleasure–and meant in the sense that we share food in community together. The service is a little different every year. This year, we had an assortment of breads from which to choose and apple juice. I felt as though I were reiterating my own decision to join this church as I ate my piece of (gluten-free) shortbread and washed it down with the apple juice. When I started at the UUC Kent, I was a lot more unsure of my decision to join the world of faith again. I was embarrassed about mentioning to people that I went to a church. I didn’t want to be one of those “church-going” people. I would even say “church” in a hushed tone lower than the rest of the sentence. And now, three years later, I find myself proudly admitting to attending church. I’ve told people that I’m Unitarian Universalist (even if they don’t know what it is). I feel confident now that I’d not only made the right decision, but I found the religious home I was looking for even when I didn’t fully realize I was looking for one. Yes, I still feel that I’ve come home. In case you’d like to hear me read my sermon, the podcast from the service is now available. I haven’t listened to it; I’m afraid. I don’t like the sound of my voice on recording. But maybe to you I sound on recording the same as you hear me (God, I hope not!). And if you don’t know me personally, and have never heard my voice for real, you won’t notice a difference. Anyway, enjoy! So. Last Sunday I went way out of my comfort zone and did something that I admit I’d been vaguely thinking of doing since I joined my church: I led a service. And not just any service. This was a service about one of my biggest passions–the music of U2. It was a long, stressful process for me to build a service, but somehow I came out of it okay. Well, better than okay. People actually liked it. And not only liked it, but it seems a lot of people–even those who were not even familiar with U2’s music–identified with it. After the service, a few people who’d lost their spouses revealed themselves to me, a few others shared their own experiences at a U2 concert, and others still told me that they now were going to look up some U2 music. Mission accomplished, right? The idea for this service came out some discussions with a fellow cyclist and UUer, Brad, about how I felt that our church should play some U2 music because of the spiritual themes in the music. I’d been to a few Christian churches and noticed that they were playing modern–albeit, Christian rock–music and it occurred to me that mainstream U2 could be played in the same slots at these churches. And if a mainstream band like U2 could be played in a Christian church, they naturally could be played in a UU church, especially since the themes tended towards the humanistic and anti-war values UUs share. Sure, there are some overtly Christian themes to U2 music as well, but, so what? The U2 version of Christianity is inclusive and loving. I know UUs have trouble saying the word “God.” Still, I thought, if my fellow parishioners could understand the context in which Bono uses the word God, then perhaps they too would see the intrinsic beauty in the music. Of course, I know I’m not the first person to come up with using U2 music in church. U2charist has been doing it for quite a while and I was actually pointed in their direction when the idea for doing an entire U2-based service was suggested to me. I would still enjoy attending a U2-based Christian service if such an opportunity arises. The next step after being given a date on which to deliver a service was total and utter panic. I wanted to do everything right, give the perfect service that gave people a nice rounded experience of U2. I wanted to relay my personal love of the band–why they have always meant so much to me–as well as familiarize others with U2 who might know nothing about them. So music was a necessity. Fortunately, I managed to drag Brad into the fire along with me since our conversations started the whole thing. I gave Brad two CDs of my favorite U2 songs and basically told him to pick whichever two he wanted. This worked out nicely–he chose “Miracle Drug” and “Yahweh” (see, we didn’t use the word “God”! ), both from the 2005 Vertigo release. I was really fortunate because another girl in the congregation named Katie stepped up and offered to sing either “With or Without You” or “Where the Streets Have No Name.” I totally jumped up at “Streets” because I’d already referenced it in the first paragraph of my sermon (the first page of my sermon was written before I was even given a date; I knew how I wanted to start it). I love “Streets” even though it’s been played incessantly on the radio and is probably the only song almost everyone–U2 or non-U2 fan alike–knows. Katie has an excellent voice. I’d heard her perform a song at our last Music Sunday service so I was really excited that she wanted to perform at my service too; I knew she’d be a great addition. I was just amazed how things started to fall into place. It was a little hard to get people moving; UUs tend to procrastinate. But once I got the ball rolling, everyone was quick to start helping out. I was initially focused on my sermon but as it came on two weeks before my service, I started to panic about the rest of the script. Fortunately, I was paired with Eric, one of the worship associates, and he was a lot of fun to work with. He helped me chose the hymns we would use. We picked “Now Let Us Sing” and my favorite, “Come Sing a Song With Me” because these were more modern and they are about music itself. Since I realized early on that the direction my sermon was headed was leaning towards music as emotional healing, Eric decided to select a story for our “all ages” section of the service that focused around a boy who found comfort from music while in a hospital recovering from surgery. Eric also decided that his reading would focus on a more scientific study of how music therapy aids in patient recovery. We would have a healthy UU mix of emotional, spiritual, and scientific side to the topic of music as therapy. Let me love you true. Let me rescue you. Same concept. Though “The Ground Beneath Her Feet” refers to romantic love, I like the idea that love can rescue a person. In a way that is not dysfunctional, but healthy. The love of parents, friends, God, life itself–whatever lifts you up and brings you back into the world. Love is hard-earned. Like riding your bike up a hill, you only get love if you’ve worked for it. You can just as easily replace the word “God” with “love” in “Love Rescue Me.” Due to the UU phobia of the word “God” (but not Yahweh), “love”‘ was probably the better word choice. Last minute inspiration hit a few days before the service when I was listening to a CD of songs I’d cut for a friend (but have not yet seen him to pass off to him). I realized that I didn’t have music selected for the prelude (while people are gathering in the sanctuary). We were already suffering confusion with arranging musicians to lead the hymns. I decided to bring “Windows in the Skies” on CD to play during this period. I figured this way people would also get to hear a sample of pure U2 music. And “Windows in the Skies” is perfect as it’s a happy praise song about love causing miraculous changes in the world and it contains several Biblical references. One of our oversights happened at the beginning of the first service when we realized that we had forgotten to get someone to play the doxology on the piano… Whoops! But I have to tell you, the doxology never sounded so beautiful as it did being sung by the whole congregation sans music. It really added something, I think, that felt very much in the spirit of my service. We also had to sing the children out of the service–as is our tradition–without piano accompaniment. It sounded better than it ever has. In my humble opinion. We were much better with the second service. Eric retrieved his call to worship (lyrics from “Stuck in a Moment”). I lit the chalice properly (but had accidentally blew it out when I blew out the lighter and so I had to light it again). We were by then used to the concept of singing a cappella the hymns, doxology, and children’s exit. I stumbled over different words in my own sermon than I’d done in the first service (saying “synthesizers” twice instead of “sympathizers”). But these were little things, hardly noticed, and they did not disrupt the quality of the service. In fact, the imperfection seemed to make it all the more beautiful. Somewhere in the middle of all nervousness, amidst the bumps, something very holy happened. I don’t know if other people felt it. It may have been just an internal feeling. But I was moved. I must have done something right. I could feel it–an energy I poured out into the whole presentation. I didn’t sense boredom when I got to the part I worried about losing people in–my page describing “Sunday Bloody Sunday.” I felt like I was holding everyone’s interest. People laughed at the appropriate places. I must have read with enough inflection. I felt I had my audience’s attention. Katie and Brad both exceeded all my expectations in the performance of their songs. It was just so thrilling hearing them both not once, but twice, and to enjoy the joyful sound they made. I didn’t expect anyone to sound like Bono; however, in their performances, they would have both done Bono proud. They definitely helped set the mood for the service. They each put a little of themselves into their singing, even if Brad insists he copied his style from Bono. Both of them definitely contributed to the spirit of the service. I have to admit that I was absolutely taken aback and humbled by all the praise I received for this service, both in person at church and then later by various friends who posted on my wall on Facebook or to the world in their statuses about my service. I seriously didn’t think I would get so many compliments. We all show appreciation for our lay friends when they lead a pleasurable service; I just didn’t think mine would really be one of them. I knew a few people would find it interesting and such. I didn’t expect people to walk out on me or anything. I guess I just expected a few mild thank-yous. I now feel guilty for every receiving line I’ve avoided after church to thank a person for the service they led. I’m just not comfortable doing the whole handshake thank you thing. But I felt totally comfortable on the other end of the receiving line and this surprised me too. I thought that would be most nerve-wrecking part of the whole ordeal… what do you say to all these people who want to shake your hand and converse with you? Apparently, it’s very easy! Much easier than trying to talk to people during our coffee hour between services. Anyway, I left church on Sunday exhausted. But happy. And relieved. I’d pulled it off, I’d done a great service (if I do say so myself? ), and, amazingly enough, I had a spiritual moment amidst a service I wrote. Maybe it was simply the open-armed acceptance–validation–I received from other people. I know that sounds rather selfish. But the truth of the matter is, I really don’t think too highly of myself or my writing. I guess I live in a world in which my inner critic screams at me all day. Like a needy child, I crave validation through the praise of others. I won’t believe I’m good until other people tell me. Even though I came into that service happy with what I wrote. I know. Who cares, right? I love to write, so I should just keep doing it. That’s all that matters. Still. Why else would a writer write but to be read? Anyway, the service wasn’t perfect and I know a lot of things I’d do differently if I ever did another service. I also couldn’t have had as successful of a service if it wasn’t for the following people: Eric, the worship associate assigned to my service; Brad, for his wonderful music; Katie, for the great rendering of “Where the Streets Have No Name” as a ballad; and Judy for putting together the awesome order of service. Thanks, everyone!! 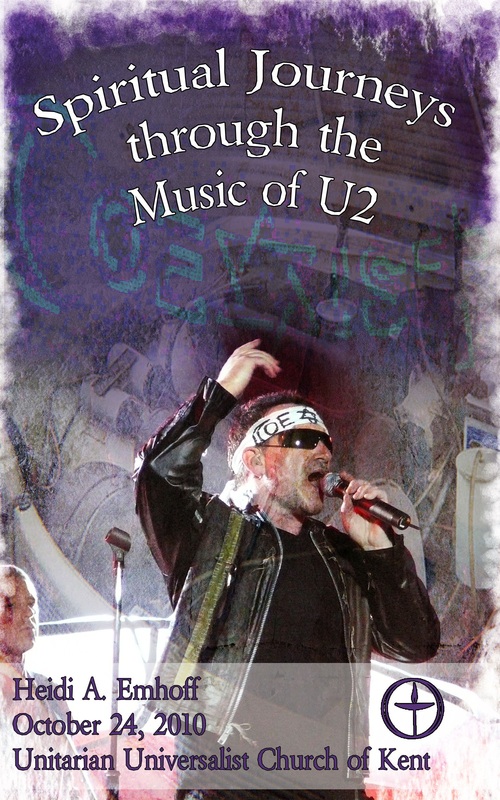 This was the lovely cover designed by Judy Brannan, the UUCK’s talented administrator, using photographs provided by Matthias Muehlbradt from U2gigs.com (my new favorite U2 fan site containing the most complete database of U2 set lists on the internet). Thanks, Matt, for letting me use your awesome photos!! The lovely Order of Service. And here’s me in front of the church bulletin board that has my name on it. *Squee* My name on a sign, at last!! Maybe someday when I get my memoir done, I’ll have the pleasure of this experience again. Anyway, I’ll post sometime this week about my experiences leading a church service, when I’ve recovered. I’ve had a long, stressful day, and I’m about ready to crash. But it was wonderful, beautiful, holy. 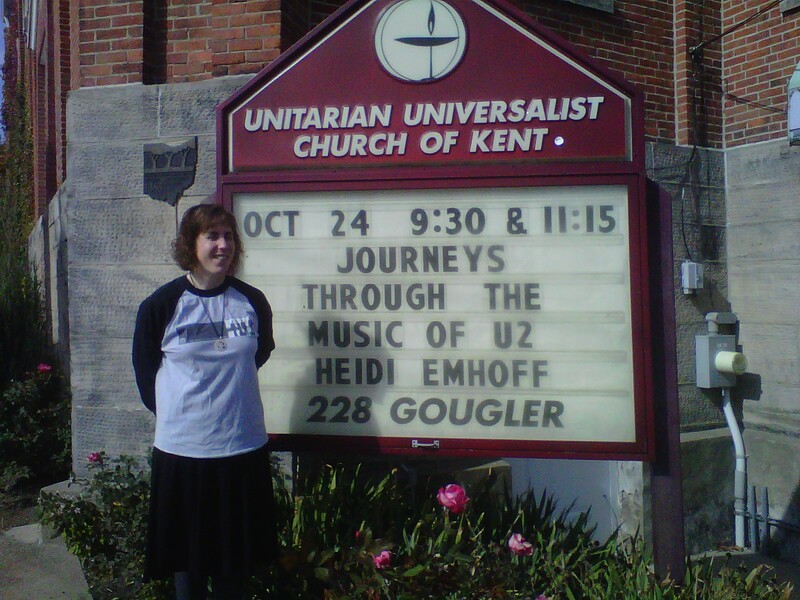 I wrote and delivered the following as the first reading at the service, Spiritual Journeys through the Music of U2, at the Unitarian Universalist Church of Kent on October 24, 2010. I went to my first U2 concert on May 3, 2001—a mere three weeks after my husband Mike died. I’d bought the tickets with three other friends many months earlier and, though I’d skipped a number of other commitments I had made prior to Mike’s death, the U2 concert was the one event I still had the heart to attend. I don’t remember many details of 2001—I suffer a kind of grief-shock black-out from that year—but that U2 concert was one of the bright spots of happiness that stand out for me in that year post-Mike’s death. We originally had bought the cheapest tickets, which gave us nosebleed seats in almost the very last row at the top of the Gund Arena. My friend Kamill, however, knew one of the people who worked at the Gund, and he asked him if we could get our seats upgraded. His friend told us that he would see what he could do, that he’d come get us at our assigned seats if he could get us better seats. From our seats in the nosebleed section, we watched the opening act jump around like miniscule ants on the stage and collectively sighed, depressed. It didn’t seem possible to us that any better seats would be available to us. The opening act had finished and we were waiting impatiently for U2 to take the stage when Kamill’s friend appeared. He motioned for us to follow him… We got up, excited, following him down, down past all the rows of the upper level; down further into the lower level. And then down again into the last section before the floor. And then he started leading us forward towards the stage. With each step, the details of the stage came into focus. I could see roadies running about preparing the equipment for U2. I would have been happy if he showed gave us seats at any point on that lower level, but he just kept moving us closer and closer and closer. Until we were just left of the stage. Section 123, second row from the floor of the arena. Right next to the stage. Throughout the show, we were close enough, as I’ve always said, to see the band members sweat. In fact, we had a clear view of The Edge throughout the entire show as he generally stood on our side of the stage. It was completely awesome. For two or three hours, I lost all thought of my problems and of losing Mike. I forgot about my pain and my sadness. My spirit was lifted up by the freedom of sound, of Bono’s voice and his passionate delivery of each song. Being at that U2 concert was better than any anti-depressant drug I could have ever been prescribed for my grief. Being given the gift of the best seats I’ll ever get at a U2 concert in my life, at that moment, was more holy than divine intervention itself. For just one night in that very long year, I was the same girl I’d always been. It felt good to not be a widow for just a little while. Below is the sermon I wrote and delivered at the Unitarian Universalist Church of Kent on Oct. 24, 2010. It was a blast. More details to follow. U2 has always been the background music of my childhood and adolescence. Every time I hear their song “Pride (In the Name of Love),” I’m reminded of summer days when I’d go to work with my dad, the forbidden ice cream he would buy me from the convenient store nearby, the smell of his work van as we bounced along the bumpy suburban Cleveland streets. At the height of U2’s popularity, when their most widely beloved album The Joshua Tree was out, I was a young teen just discovering myself and the words of “Where the Streets Have No Name” appealed my youthful longing to begin an adventure of my life—“to tear down the walls that [held ] me inside”. Each of their releases remind me of a period of my life. I distinctly remember listening to their 1991 album Achtung Baby as I drove to work and school throughout my sophomore year of high school. I listened to their 1993 release Zooropa on the way to a family reunion in Wisconsin the summer between graduating high school and attending college; the song “Dirty Day” repeated over and over in my headphones so that to this day the song conjures an image of the beaches of Kenosha. Pop was released in 1997 when I graduated from college, and though I’ve only recently bought the CD, the songs “Staring at the Sun” and “Discotheque” remind me of the excitement of graduation, the fear that I would never find a job, the confusion over what I was going to do with my life. It wasn’t until late 2000 with their release All That You Can’t Leave Behind that their music started to become more deeply significant to me. I was by then a young, married career woman, full of idealism and hopes of an exciting new future. I immediately fell in love song “Beautiful Day” for its upbeat sound and hopeful lyrics that hinted slightly at some of the troubles of the world while expressing a kind of delighted praise. After the flood all the colors come out…. As inspired as I felt at that moment (and you can tell from this email excerpt that I was then in a good place in my life), things abruptly changed for me just a few months later when my husband died. And then All That You Can’t Leave Behind contained the songs that became, by mere circumstances of timing, the dirge for my grieving. Whenever I listen to that release, I can’t help but remember the insanity that was my life in 2001—the loss of my husband, the cascading events of emotional strife with his family and myself, the growing disconnect with my friends who didn’t seem to really understand what I was going through. And then, only five months later, September 11th. The song “Walk On” became my anthem. Though it is really about the imprisoned Burmese political leader Aung San Suu Kyi, I felt the words of this song spoke directly to the turmoil going on in my life. I envisioned the Darkness as the line between life and death that separated me from my husband. I was caught within the darkness, held prisoner by my sadness, and daylight—the possibility of renewal—was a long way off. I wanted to turn back—leave myself stuck in that place of memories—but this song was telling me to be strong. Those words reminded me that the love I felt for my husband was something a lot of people have never had a chance to experience in their lives. It told me to forgive my friends and family for not understanding what I was going through, to forgive all the people who had said thoughtless, insensitive things to me about grief and my husband’s death. Most importantly, it told me to let go of my anger. To walk bravely on. Though a chosen atheist since the sixth grade, I began to re-explore spirituality. My husband’s death had rattled what I thought were pretty firm foundations as far as faith—or my lack thereof–went. But like an atheist in a foxhole, as the saying goes, I no longer felt secure in believing in nothing. It was at about this time that a whole new dimension of my favorite band’s music opened up to my thirsty soul. I’d always known that at least three members of the band professed themselves as Christians; however, it never occurred to me how many of their songs actually made reference to the Bible, Christian mythology, and faith itself. These messages were never overt but you had to have to theistic background to understand the references. In exploring faith for the first time since my childhood, I finally had the tools and background with which to really listen. It’s not that U2 is a Christian rock band; I like to think of U2 as a mainstream rock band who happens to also be Christian. Their music speaks of the emotional—and sometimes shakable—manic-depressive nature of faith. There are songs of praise and songs of sorrow; songs of love and songs of anger; songs of hope and songs of doubt. There are also songs about the current state of the world—a call to action, a call for peace, a call for social change. U2’s music bespeaks a tolerant, humanistic Christianity. The kind of Christianity I’d jump right into if I had heard it preached somewhere and honestly followed. You don’t have to know anything about the band U2 to recognize the name of its front man, Bono, for he is known internationally for his work as a political and human rights activist. Yes, he has a real name—it’s Paul Hewson—but he’s adopted the stage name “Bono” from a nickname a friend gave to him as a teenager. The remaining, often lesser known, members of U2 are: The Edge (whose real name is David Evans) who plays guitar and keyboards, sings backup vocals, and co-writes with Bono many of U2’s songs; Adam Clayton, the bassist; and Larry Mullen Jr., the drummer. As the story goes, the band that was to become U2 was formed when Larry Mullen posted a notice seeking musicians for a rock band at the secondary school all three attended in Dublin, Ireland. Of the four, only Larry and The Edge actually had musical training; Adam had a bass but didn’t really know how to play; Bono could play some guitar and had not originally set out to be the vocalist. But what this would-be band lacked in actual talent in their humble beginnings, they made up for in enthusiasm for music. There is a hurried, unedited earnestness to the songs on October. Each song flows from one to the other in a poetic stream of consciousness—a journey of through the soul of U2 in which you come out on the other side just a little bit changed. I love this about U2. Each album stands on its own as a separate work of art with a different mood and tone. The strength of U2 lyrics is in the words they use to paint a single feeling, thought, idea. One of U2’s most noted and consistently relevant songs is “Sunday Bloody Sunday.” This song references the 1972 event known as Bloody Sunday in which six civil rights protesters were shot by British soldiers in Derry, Northern Ireland. Because one of the major sources of contention between the continually battling factions in Northern Ireland was based on the two religions of Catholicism and Protestantism, the song contrasts Bloody Sunday to the events of Easter Sunday—a religious holiday shared by both religions. The real battle has just begun. To claim the victory Jesus won. In the early 1980s when this song was first performed live, Bono marched around stage, waving a white flag and inviting the audience to shout with him, “No more!” Because he didn’t want to be confused as a sympathizer for either side of the conflict, he prefaced each performance with the disclaimer that “Sunday Bloody Sunday” was not a rebel song; it was an angry protest against the bloodshed inflicted by and on both sides. In the years following the song’s initial release, acts of terrorism perpetrated by the IRA gave the song additional teeth. On November 8, 1987—while U2 was on tour in Denver, Colorado—eleven people were killed when an IRA-planted bomb exploded near a war memorial in Enniskillen, Northern Ireland. That night yielded one of the most emotional performances ever of “Sunday Bloody Sunday” in which Bono broke into a full-out angry rant condemning the bombing and the sympathizers to the IRA’s cause. The performance is captured on U2’s Rattle & Hum documentary and is quite powerful. After that performance, U2 didn’t play “Sunday Bloody Sunday” live for many years. However, it returned to set list of some concerts during the 1990’s. It again became a consistent song on the set list for the 2001 Elevation tour, the most memorable rendition filmed on September 1st—just days before September 11th—at Slane Castle in Dublin, Ireland. At this show, Bono closed out the song by reciting the names of the 29 victims of the 1998 car-bombing in Omagh, Northern Ireland. Despite its very specific references to the Irish political scene, “Sunday Bloody Sunday” has, over the years, become U2’s song of protest against war, injustice, and discrimination where ever it may be in the world. During every show of the 2005 Vertigo tour, Bono donned a handmade headband bearing the popular Coexist symbol and broke mid-song into an impassioned plea for peace between the three Abrahamic faiths and ended the break with a beautiful hymn-like song. On the current concert tour, scenes from the 2009 Iranian election protests—with green Persian writing over top of them–are projected on the screen above the stage as the band plays the song. Josephine, be careful of small men with big ideas. I have no problem with a band with the popularity and influence that U2 has acquired using their means to effect change in the world. To speak out against injustice. To give voice to those who don’t have the power and influence to do so for themselves. I admire U2 for being so upfront, so vocal. It’s exactly the same way I go about inspiring change in the world. For all that “I was lost, I’m found,” it is probably more accurate to say, “I was really lost, I’m a little less so at the moment.” And then a little less and a little less again. That to me is the spiritual life. The slow reworking and rebooting of a computer at regular intervals, reading the small print of the service manual. It has slowly rebuilt me in a better image. It has taken me years, though, and it is not over yet.